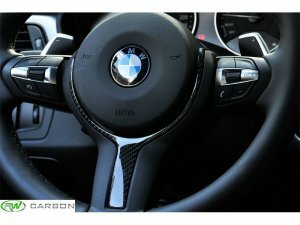 Complete the look of your interior with this carbon fiber steering wheel trim for your BMW. This steering wheel trim takes the place of your existing trim to provide you vehicle with a more custom interior look. This carbon fiber steering wheel trim is skillfully manufactured from precision ABS plastic that is then overlayed with 3K twill weave carbon fiber. To ensure a long lasting shine the CF steering wheel trim is finished with a clearcoat. Please see application list below for complete list of BMWs this carbon fiber steering wheel trim will fit. NOTE - Your vehicle must be equipped with M sport package for this steering wheel trim to fit.